I can't begin to tell you how excited I was when I was chosen to review the Butter Bell® crock. This crock is a brand name of butter crocks owned and distributed by L. Tremain. 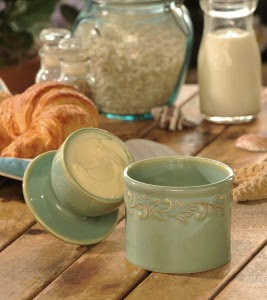 They are the brand leader and largest seller of butter crocks in the US, with many styles and colors to choose from. The product line was also recently featured on the Food Network on the show "Unwrapped" which is shown on their website. Product Description: A modern version of the original French butter crock, the Original Butter Bell® crock allows butter to be kept at room temperature, on the counter or tabletop, for up to 30 days without spoilage, refrigeration or odors. Made from New Bone China, the highest quality ceramics available, the Butter Bell crock insures that under reasonable, correct usage, butter storage time can be up to 30 days. Most Butter Bell users consume a crock’s worth of butter within one week. I love to use butter on my toast, muffins, breads, in baking, etc., but the problem is that unless you want the product to get rancid, you have to store it in the fridge. That makes for hard butter that is almost impossible to use right away. Since I don't like to wait, I started resorting to spreadable margarines which, in humble opinion, taste, well, margarine-y. So, when I received this in the mail, I immediately put "butter" on my shopping list. As soon as I got home from the store, I unwrapped a stick and, following the directions provided, packed the softened butter firmly into the bell-shaped cup of the lid (see picture below). I poured some cold, fresh water into the base of the crock, replaced the lid into the base of the crock and voilà! Soft, spreadable butter that can be enjoyed and served right from the crock! Works for Me! The directions also state that the water should be changed out every three days to ensure freshness. At first, I was skeptical, because I couldn't figure out how the water wasn't going to make the butter taste odd. That is, until I realized that water and oil do NOT mix. I can't believe how simple this is! No wonder this brand of crocks has been the most popular in the US for over a decade! There are two ways that you can purchase these crocks. You can Shop online or check the store locator. The approximate cost of these crocks is around $22.95. However, there is a *Holiday Special* that is going on right now. When you buy two, you will get one free! I am thinking that these would make awesome Christmas Gifts for my sisters! This offer is good until 12/15/10. Check out the website for many more tabletop and gift ideas. There is also a complete line that matches the crocks. Endorsed by top chefs worldwide. Safely stores butter on your counter top without spoiling. Avoid messy microwave disasters from trying to melt cold, hard butter. Holds 1 stick of butter and keeps it perfectly spreadable. 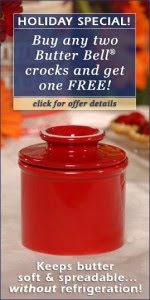 Prize: One lucky winner will receive their own Butter Bell® crock! Visit Butter Bell® and tell me something you learned from their site. Disclosure: I received a free product in exchange for my honest review. No monetary compensation was received. All opinions are mine alone. Sponsor is responsible for shipping prize to winner. OMG, I love the butter Spreaders they have, I would eat more biscuits and toast just to use them! I learned that the Butter Bell crocks are made in China, by a top manufacturer of ceramic products. The crocks are made from the highest quality materials and are completely safe and contain no lead or cadmium. WOW you are on fire with the giveaways! I was not even going to enter this until I saw Annie Jones comment. Then I went and checked out the site adn watched the Food Network video. I think I need on of these! I love the floral one with "Beurre"...French for butter. I guess the thing I learned is that I need one of these. LOL! I entered your Taco Night giveaway. this is so awesome! we use a lot of butter in our home, so much easier to store! I learned do not store on a counter near a stove/oven or in a window sill. 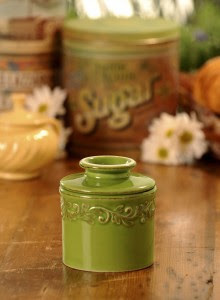 Bistro Butter Bell Crock reminds of home, back at my grandmother house. I use to have a ceramic business and that's when I became cognizant of the dangers of lead in glazes on dishware and containers that come in contact with our food. Glad to see that these butter crocks don't use any heavy metal containing paints. I now follow you on networked blogs too. I learned that they also sell tea steepers.